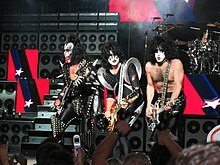 The following is the discography of the American rock band Kiss. The group, formed in 1973, first consisted of bassist Gene Simmons, rhythm guitarist Paul Stanley, lead guitarist Ace Frehley and drummer Peter Criss. It is the most recognizable and successful line-up, which lasted until Criss' departure in 1980. The band is known for its make-up and stage antics, which influenced many artists who later used similar effects in their concerts. The band's eponymous debut album was released in 1974. Despite the constant touring and promotions, the album peaked at 87 on Billboard, without the benefit of a hit-single. The follow-up album, Hotter Than Hell (1974), was a bigger disappointment, peaking at 100 and quickly dropping off the charts. Dressed to Kill, released in 1975, was a much bigger success, breaking into Top-40, but the band's record label, Casablanca Records, was close to bankruptcy and needed a commercial breakthrough. This would later be achieved with both Kiss' and Casablanca's first Top-10 album, the double-live album Alive!, which featured the number 12 hit "Rock and Roll All Nite". The next three albums, Destroyer, Rock and Roll Over and Love Gun were successful, achieving Platinum status and spawning Top-20 singles (including the number 7 ballad "Beth", the band's highest charting single in the US). Their seventh studio release, Dynasty, while being a musical departure, was a global success, thanks largely to the worldwide hit, "I Was Made for Lovin' You". The next three albums, Unmasked, Music from "The Elder" and Creatures of the Night, were domestic commercial failures, even as the band maintained popularity in many other parts of the world. Lick It Up was the first album featuring the band without make-up and was certified gold. Their next studio releases (Animalize, Asylum, Crazy Nights, Smashes, Thrashes & Hits) were more successful and Kiss recaptured some of their earlier glory (though not to the level of their '70s heyday). Hot in the Shade was the lowest charting album of the unmasked era in the US, despite the success of the top 10 power ballad "Forever". With their 16th studio release, Revenge, Kiss attempted to modernize their sound for the 1990s with heavier songs. The album initially charted at #6 on the Billboard 200, and quickly reached Gold status in the US. 1997's Carnival of Souls: The Final Sessions was released after the reunion tour and did not receive much promotion. It has yet to be certified Gold in the US despite the album's lone single "Jungle" reaching number 8 on the US Hot Mainstream Rock Tracks. Followed by a highly successful reunion, in 1998 Psycho Circus was released and was a moderate success. Their first album in 11 years, Sonic Boom, was released in 2009. The band released their 20th studio album, Monster, on October 9, 2012. To date, Kiss have had 21 million copies certified by the RIAA in the United States. The band has 30 gold albums as of July 2015. October 14, 1975 "Rock and Roll All Nite" (live) / "Rock and Roll All Nite" 12 — 18 13 — — — — Alive! November 17, 1981 "A World Without Heroes" / "Dark Light" 56 — — — — — — 55 Music from "The Elder"
A ^ The single was first released with "Dirty Livin'" as the A-side and "Sure Know Something" as the B-side when it reached no. 25, and later released with "Sure Know Something" as the A-side and "Dirty Livin'" as the B-side. The singles "Beth" and "I Was Made for Lovin' You" have been certified Gold by the RIAA and CRIA. The single "Psycho Circus" has been certified Gold by the IFPI Sweden. B ^ The single reached number 2 in Japan. 1981: Endless Love – "I Was Made for Lovin' You"
1991: Bill & Ted's Bogus Journey – "God Gave Rock 'N' Roll to You II"
1993: Dazed and Confused – "Rock and Roll All Nite"
1994: Speed – "Mr. Speed"
1996: Beautiful Girls – "Beth"
1999: Detroit Rock City – "Shout It Out Loud", "Detroit Rock City", "Nothing Can Keep Me from You"
2000: Lucky Numbers – "Heaven's on Fire"
2001: Rock Star – "Lick It Up"
2007: Halloween – "God of Thunder"
2009: I Love You, Beth Cooper – "Beth"
2011: The Dilemma – "Detroit Rock City"
2014: Magic Mike - "Calling Dr. Love"
2003: We're a Happy Family: A Tribute to Ramones – "Do You Remember Rock 'n' Roll Radio?" 2014: The Art of McCartney - "Venus and Mars/Rock Show"
2015: Scooby-Doo! and Kiss: Rock and Roll Mystery - "Don't Touch My Ascot"
^ Jones, Emma (May 11, 2010). "Kiss: still rocking hard". BBC News. Retrieved June 27, 2011. ^ "RIAA Top Selling Artists". Archived from the original on July 25, 2013. Retrieved June 27, 2011. Peaks before 1989: Kent, David (1993). Australian Chart Book 1970–1992. St Ives, N.S.W. : Australian Chart Book. ISBN 0-646-11917-6. Peaks after 1989: "australian-charts.com - Discography KISS". Hung Medien. Retrieved 2014-08-10. Kissworld: "ARIA Chart Watch #513". auspOp. February 23, 2019. Retrieved February 23, 2019. ^ a b c d e f "Search - RPM - Library and Archives Canada". collectionscanada.gc.ca. Retrieved 9 August 2011. ^ a b c d e f "Discographie Kiss". GfK Entertainment. Retrieved April 4, 2019. ^ a b c d "Norwegian albums and singles database for Kiss". Lista.vg.no. Archived from the original on 2005-08-17. Retrieved 2011-11-11. ^ a b c d e Steffen Hung. "Swedish albums and singles database for Kiss". Swedishcharts.com. Retrieved 2011-11-11. ^ a b c d e f "UK album and singles database for Kiss". Chartstats.com. Archived from the original on 2012-06-29. Retrieved 2011-11-11. ^ "UK search:Kiss albums". EveryHit.co.uk. Retrieved 2008-09-24. ^ a b c d e f g h i j k l m n o p q r s t u v w x y z aa ab ac ad "American certifications – Kiss". Recording Industry Association of America. ^ a b c d e f g h i j k l m n o "Canadian certifications – Kiss". Music Canada. ^ a b c d e f g h i j k l m n KISS Catalog Nielsen Soundscan sales 2012 Archived 2012-06-29 at the Wayback Machine. ^ "Rock And Roll". rockandroll.gr. Archived from the original on 2010-08-06. Retrieved 2012-02-28. ^ a b IFPI Gold and Platinum Search for albums by Kiss Retrieved June 27, 2011. ^ a b "Veckolista Album - Vecka 31". 3 August 2012. Retrieved 8 August 2012. ^ "Canadian certifications – Gene Simmons – Kiss". Music Canada. ^ "Canadian certifications – Ace Frehley – Kiss". Music Canada. ^ "Canadian certifications – Peter Criss – Kiss". Music Canada. ^ "Canadian certifications – Paul Stanley – Kiss". Music Canada. ^ a b c CAPIF Gold and Platinum Search for albums by Kiss[permanent dead link] Retrieved June 27, 2011. ^ "Gold & Platinum Certification – 1997". Australian Recording Industry Association. Retrieved June 27, 2011. ^ a b "Gold & Platinum - RIAA". RIAA. Retrieved 2018-09-11. ^ "Billboard Hot Mainstream Rock Tracks Hell or Hallelujah". ^ "Kissfaq single chart Hell or Hallelujah". Archived from the original on 2012-12-08. ^ "RIAA Gold and Platinum Search for singles by Kiss". Riaa.com. Retrieved 2011-11-11. ^ "Music Canada Gold and Platinum Search for singles by Kiss". musiccanada.com.com. Archived from the original on 2012-02-25. Retrieved 2011-11-11. ^ "IFPI Sweden list of certificates 1987-1998" (PDF). Archived from the original (PDF) on July 25, 2011. Retrieved June 27, 2011. ^ "夢の浮世に咲いてみな【ももクロ盤】". Oricon. Retrieved 2015-11-25.